I’m not sure which is the more startling: Driving past our local marina and seeing 15th-century masts towering over the more-usual fishing boats or stepping onto one of these replica ships and realizing that people actually crossed a big scary ocean and lived for months in something smaller than most people’s closets. Well, the closets of really rich people, anyway. But, still. 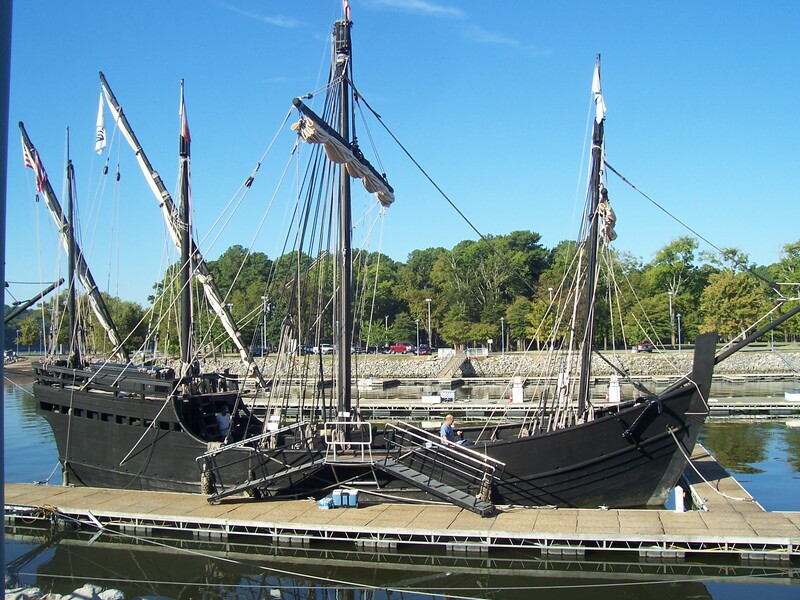 These replicas of Christopher Columbus‘s Nina and Pinta are tiny, tiny, tiny. See the guy to the right of the center in the photo on the left? He practically can touch both sides of his ship when he stands in the middle and stretches out his arms. Truly. Built with hand tools in Brazil and owned by a British charity in the British Virgin Islands, these ships are making their way along the Mississippi and Tennessee rivers. When they dock in local harbors, the captain and his volunteer crew open the ships for tours. They’re here in Florence, Alabama, through Monday. Come take a look. You’ll be amazed. These ships come to my town every few years or so. They previously were here in 2003, and I remember because they were at the marina when my now-husband officially asked me to marry him … on a day that happened to be Columbus Day. And why that strikes me as funny — that I got engaged on Columbus Day — I have no idea. Help!!! This entry was posted in Alabama, family, Florence, history, travel and tagged Alabama, Christopher Columbus, family, Florence, history, Nina, Pinta, replica ships, travel, vacations by Coffee with Cathy. Bookmark the permalink. The whole Columbus Day thing was a complete coincidence. The key thing is that it was a Monday, back in those glorious years when I had Mondays off. A happy day, regardless. JP – Aw! I’m glad you think so.